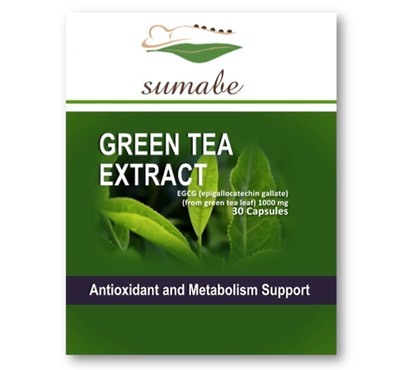 Sumabe Green Tea Extract contains concentrated levels of EGCG (epigallocatechin gallate) which is one of the most beneficial polyphenol components found in green tea, and is a powerful antioxidant that also has thermogenic (fat burning) properties, which helps increase metabolic activity. The polyphenol antioxidants in EGCG also support the body’s cardiovascular system. Sumabe Green Tea Extract assists in the maintenance of a healthy cardiovascular system and helps to maintain general wellbeing. Adults, take 1-2 capsules daily, with meals, or as directed by your healthcare professional. Warning: If you are pregnant, may become pregnant, or are breastfeeding, have a history of blood coagulation disorders, liver dysfunction, or are taking any prescription drug, please consult your health care professional before using this product.